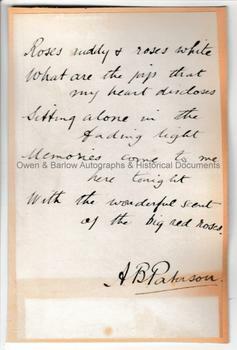 BANJO PATERSON autograph Poem Signed. Andrew Barton Paterson (known as Banjo Paterson). Australian bush poet, author and composer. Best known for the ballad 'Waltzing Matilda'. Autograph verses being the opening lines of his poem 'A Bunch of Roses', signed "A.B. Paterson". 18 x 12 cms (7 x 4.75 inches). Mounted on old pasteboard album leaf. Verso has the signature of the Anglo-Italian marine artist Eduardo de Martino (1838-1912) on H.M.S. 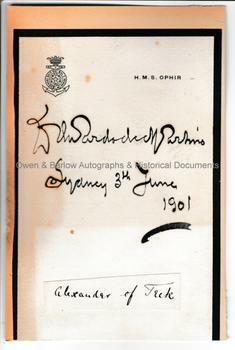 Ophir notepaper, dated Sydney, 3rd June 1901 and also the cut signature of Alexander of Teck. Some browning and offsetting but generally very good. Banjo Paterson is one of the most celebrated of Australian poets. 'A Bunch of Roses' appeared in his book of verses 'The Man From Snowy River' published in 1895. It was a huge seller and quickly made him a household name in Australia and established his reputation as the foremost poet of Australian bush life. Banjo Paterson's Waltzing Matilda is now known the world over. His reputation endures and his portrait appears on the Australian $10 bill. Signed verse quotations by Paterson are rather uncommon.